If your home is fortunate to have a fireplace and you’ve been thinking about a makeover, there are several creative options available to make a stunning statement in your décor. When fireplaces were installed during home construction decades ago, many of them shared a practical design but not necessarily one that held up as décor styles changed. Indeed, some perhaps have been considered an eyesore as time went on that the living room configuration had to tolerate and not instead incorporate into an overall design. But it doesn’t have to be that way. 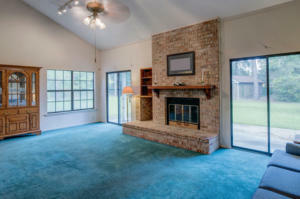 A brick fireplace with a tasteful makeover can become a focal point that will be pleasing to the eye for years to come. There are basically three approaches for a new look to your fireplace’s brickwork—covering part of the brickwork so only the firebox area remains, enlarging the brickwork to take in the entire wall, or painting or resurfacing the brickwork to match a new décor. Here are some options for a fireplace makeover in Rocky River. A fireplace insert adds an attractive, cozy look to a rustic brick wall. One popular design is to cover brick that is above the mantel with paneling or tile. This gives you the option to hang a mirror or painting above the firebox and build shelving on both sides. If your dream is for a complete makeover, a total tear out offers many possibilities. Some popular designs combine stone with tile and wood to give a unique appearance. The combinations are many, and are only limited to your imagination. If your house has a rustic feel, you might want to lean heavily on wood components, and less on tile. Stone also is an attractive material for a rustic look, and is available in manufactured and actual styles. A floor-to-ceiling fireplace brick fireplace makeover helps tie the two together in a unified, modernized look. Many brick fireplaces used red brick that, frankly, now looks outdated. That applies even more if the fireplace is a floor-to-ceiling style. But by using a stone or manufactured stone material, creative shelves and enclosures can add a chic look without requiring a tear out. Expanding the brick area over your fireplace offers space for a TV. Some homeowners are even hanging a digital television over the fireplace to take advantage of the new design. Don’t forget dramatic lighting to highlight display objects such as antiques. This adds to the depth and charm of the room. Another consideration is the mantel shelf. A more modern-looking mantel will add to the look and feel, and mantels are available in various styles and materials. After installing a new fireplace insert, a coat of white paint ties together the contrasting brick. Existing brick can take on a distressed look with smear treatments, whitewashing or color washing. For instance, the look of Staffordshire blue may be obtained by painting a red brick fireplace a dark matte blue. When the paint is dried, a color wash (a mixture of blue paint, white paint and water) is applied and quickly wiped off. As part of a fireplace makeover, it’s a great time to redo the hearth—the brick surface directly in front of the fireplace that prevents sparks and embers from catching the room on fire. A marble or granite hearth adds interest and beauty to the fireplace. Tile, as well, offers a variety of styles to the hearth. Fireplace inserts come in three types: wood burning, gas burning and electrical. All are enclosed units, meaning the firebox is closed off with doors. 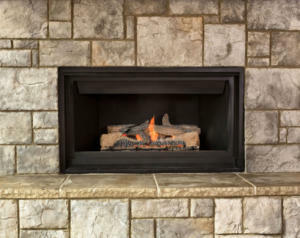 Gas or electric fireplace inserts provide many options for designing surrounding walls and enclosures. A wood-burning insert is great for those who favor a traditional wood fireplace. Most also include a blower to circulate the warm air, helping to heat the house. You’ll have to have a supply of wood on hand, and take care of the fireplace as you would a traditional wood burner. Those who favor a gas-burning insert want the convenience of turning on a switch to start a simulated a wood fire, complete with ceramic logs. Gas logs are available for installation for those homeowners who want the look of wooden logs in an open rack, if you would rather go that route. Electric inserts also provide heat and simulate a wood fire. They vent less, making them easily installed in most spaces. Some offer an option of a simulated flame without heat. When it comes to a fireplace makeover in Rocky River, Sciarappa Construction will help you achieve your goals. If you have a design, we will work with your idea, or if you need a design, we will help you. 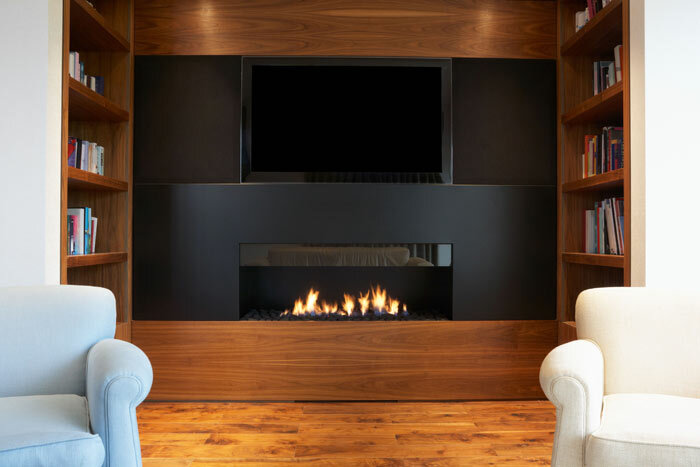 With more than 40 years of experience in remodeling and construction projects, Sciarappa Construction offers the highest level of proficiency, quality and efficiency to complete your fireplace makeover project to your satisfaction. It just takes a call to get started. Contact Sciarappa Construction at (440) 930-2882 or by email at info@sciarappaconstruction.com. Located at 32961 Pin Oak Pkwy., Avon Lake, OH 44012, our website is https://sciarappaconstruction.com.